Day 1: Arrive into either Belfast Airport. Enjoy chauffeur driven private transfers to the 4-star Adelphi in Portrush. Spend your evening relaxing at your hotel and enjoying the charm of Portrush. Day 2: You start off your Northern Ireland golf experience at the Royal Portrush on the Valley Links Course. The Royal Portrush is the only club in Ireland to have hosted the British Open. In advance of your first links outing, we will provide a special 1-hour instruction with a PGA professional to guide you on your links adventure. Day 3: Today you will play historic Portstewart Golf Club. Founded in 1894, this championship links course features towering dunes and gorgeous views from every hole. Get ready for a day of golf you will never forget! Day 4: We will stay in the far north of the island today and play Castlerock Golf Club. This is a classic links course founded in 1901 and set on the Causeway coast. The signature hole on this course is the "Leg o' Mutton" as it requires a tee shot over a burn and it featurs a railroad track on the right. Day 5: The highlight of our time in the north of Northern Ireland will conclude when you head back to the Royal Portrush to play the Dunluce Course. In the evening, we will move towards the south and change hotels to the 4-star Canal Court in Newry. .
Day 6: Today will we play Ardglass. Located on the stunning County Down coast and overlooking the Irish Sea, Ardglass is a links course with views of both the sea and the Mourne Mountains from every hole. It is ranked one of the world's top links courses in the world. Day 7: We saved the best golf for last! 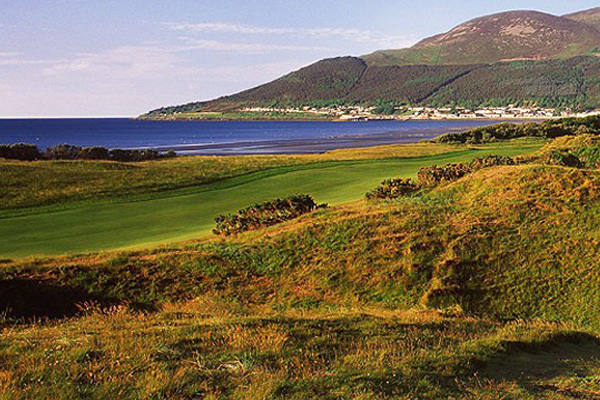 Today we will take you to play the Royal County Down, currently ranked the #1 Golf Course in the World! You are now in the heart of the Kingdom of Mourne. Stunning scenery and challenging play await you for all 18 holes of this most majestic of golf courses.